Ben Brae on-the-Park Bed and Breakfast.... a quiet and friendly, romantic atmosphere... A custom, upscale home featuring a tranquil, third acre property overlooking a mature, borrowed vista. 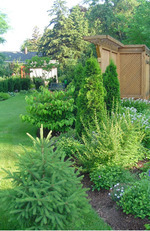 A front woodland garden with pond and bubbling rock welcomes the visitor. Enjoy our front guest living room or lovely back patio area. 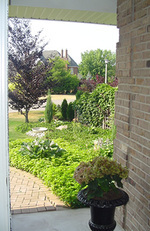 We are located in Old Town Niagara-on-the-Lake, and within walking distance to shops and theatres. We are houses away from the historic 750 acre park which includes the famous Niagara Recreational trail, and within proximity of the Heritage Trail which connects with the famous Bruce Trail. 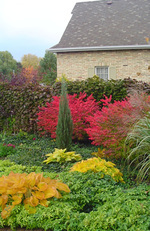 We are very close to many of the Niagara region's finest vineyards and numerous attractions. We offer our guests three attractive bedrooms all with private, bathrooms. Our master Chablis suite with fireplace, four poster, queen bed and adjoining, jacuzzi bathroom is delightful. Our romantic Burgundy guest room with queen bed and oversized, adjacent, private bathroom overlooks the back garden, and the Trius, ground floor guest room with double bed and with 3 pc. ensuite is particularly handy for those who dislike stairs. The Trius guest room overlooks the front woodland garden area. Walk-in showers are also available. 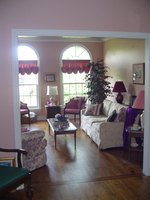 We offer a guest living room and a large dining room where we often serve a hot breakfast by candlelight. Our guests particularly enjoy coffees and cocktails on the back patio. We look forward to hosting you and sharing advice and stories about the area. There really is something appealing for everyone in the Niagara region. We are in an excellent location for those who enjoy walking or biking as we are within 5 houses of the Niagara Recreational Trail and yet less than 1.4 kil walk from the clock tower in old town. We look forward to hosting you in beautiful, historic, Niagara-on-the-Lake, Ontario. Best wishes and thank you for interest and your time. We serve our guests a tasty, varied breakfast each morning. Tea and coffee are normally ready ahead of breakfast. 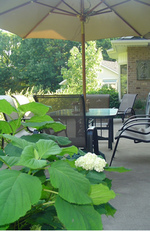 Our guests often enjoy a coffee or tea on our garden patio area overlooking a mature third acre vista. You will often be accompanied by all kinds of wild bird songs welcoming the new day. We defer to fresh fruits, egg dishes and lots of fresh herbs etc. With the exception of one special dish we do not serve meat with our breakfasts. Please advise your hostess of any allergies or food aversions.